The Knesset Research and Information Center’s (RIC) report reveals that the army invests tens of millions of shekels a year in programs that assist lone soldiers; in addition, the defense establishment discriminates between Haredim and those who choose to leave the ultra-Orthodox community, even though the latter are also included in the draft quota and come from the same background. 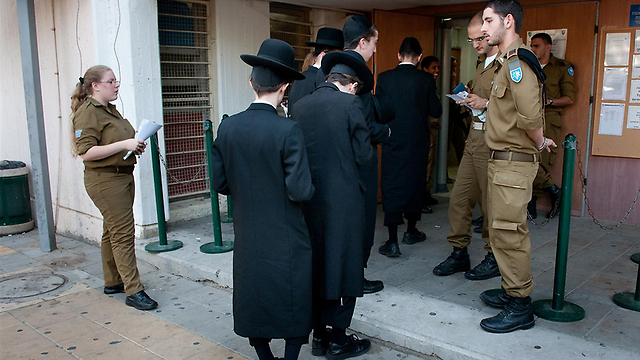 The Knesset Research and Information Center’s (RIC) report, obtained by Ynet, on ultra-Orthodox enlistment in the IDF has revealed that as of last August, 7,250 Haredi soldiers enlisted in the IDF, about a third of which defined as lone soldiers. The RIC published the report on the backdrop of the coalition crisis over the Israeli Defense Service Law, and just hours before the HCJ had decided whether to grant the state another extension to enact a new draft law. The report, which was commissioned by Yesh Atid chairman MK Ofer Shelah, and the “Out for Change” organization, shows that the army invests tens of millions of shekels a year in programs that assist lone soldiers (out of NIS 180 million allocated for this purpose). In addition, the Ministry of Finance allocates NIS 200 million each year to help integrate religious soldiers in the job market, in light of the figures indicating that the rate of employment among draft dodgers is 45%, as opposed to 90% among those who choose to enlist. The implications of these figures are twofold. On one hand, the special needs of the ultra-Orthodox community obligate the state to pay a price for integrating this sector into the army, and later on, into society. On the other, these funds could have been invested equally in various army populations or in more important missions—protecting the nation and winning wars. According to the report, the defense establishment discriminates between Haredim and those who choose to leave the ultra-Orthodox community, even though the latter are also included in the draft quota and come from the same background, sometimes dealing with more difficult circumstances. The report, which also presents data on religious Zionist yeshiva students, reveals that every year three-quarters of yeshiva graduates receive a service deferment or an exemption. 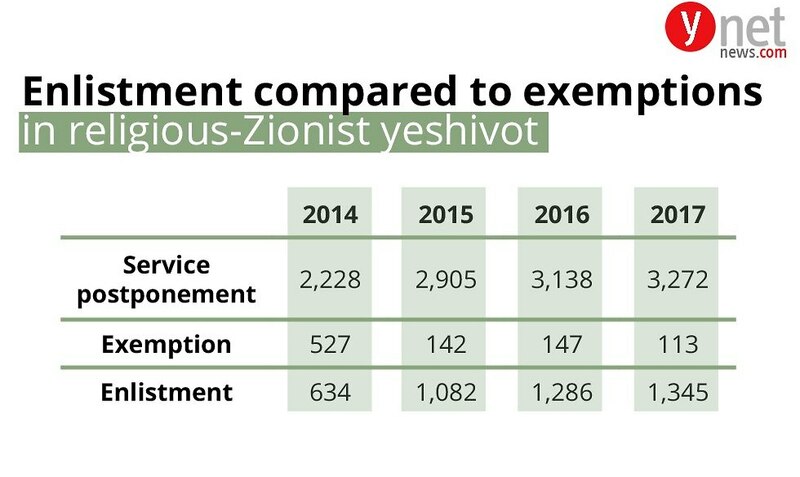 In 2017, 3,272 yeshiva students received a service deferment, and 113 were exempt from service. These figures could be explained by the fact that many yeshiva students postpone their service in order to volunteer in a pre-military academy. According to the data, 1,345 students enlisted in the IDF in 2017, while 634 enlisted in 2014. However, the data could also indicate higher rates of draft dodgers. 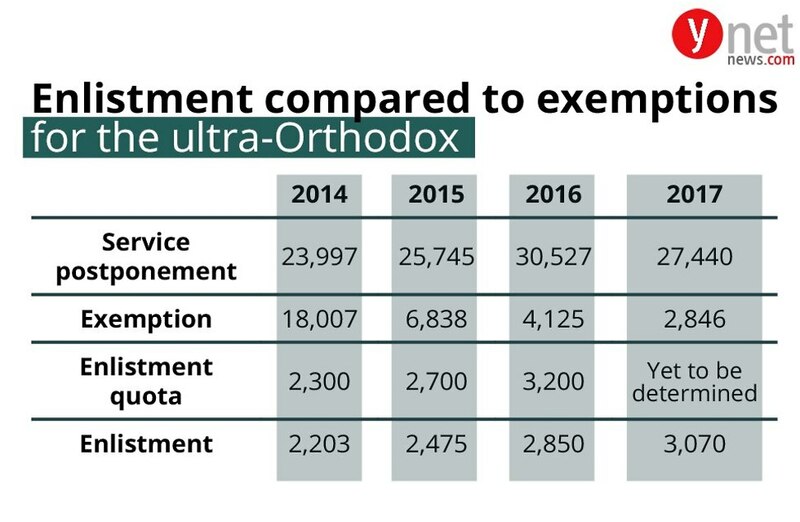 In 2014, the Israeli Defense Service Law limited the scope of exemptions and service delays granted to the ultra-Orthodox community. In the same year, 42,004 (18,007 exemptions and 23,997 consecutive deferments) Haredim received service exemptions. 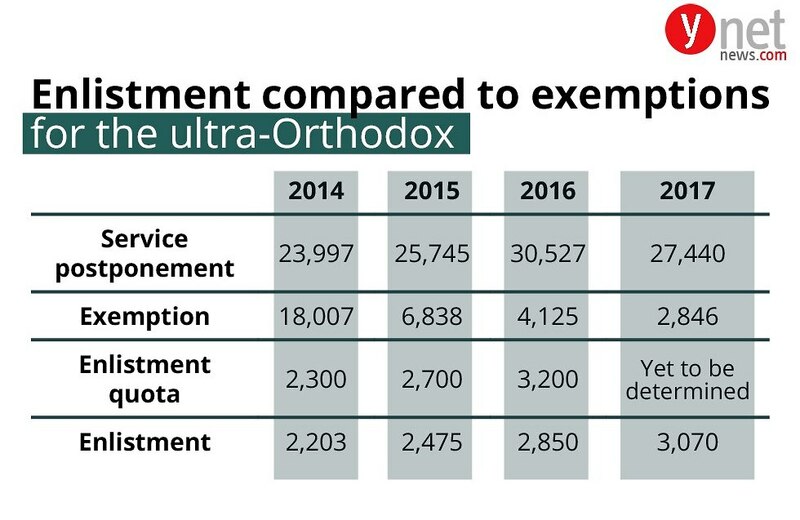 The following year, the numbers dropped to 32,583, while in 2016 figures stood at 34,652 service exemptions, and in 2017, 30,286 Haredim received a service deferment or an exemption. Although these figures still don’t meet the targets set by an earlier version of the Israeli Defense Service Law, they correspond with the steady rise of ultra-Orthodox recruits in the past three years. In addition, the IDF has been implementing a stricter policy when dealing with new recruits. It is this policy that periodically leads to demonstrations of the ultra-Orthodox community. In 2016, the army recruited 2,850 ultra-Orthodox youths, 350 less than the enlistment quota. Last year, the IDF recruited 3,070 Haredim. In recent years there has been about 50% increase in the numbers of recruits defined as Haredim. 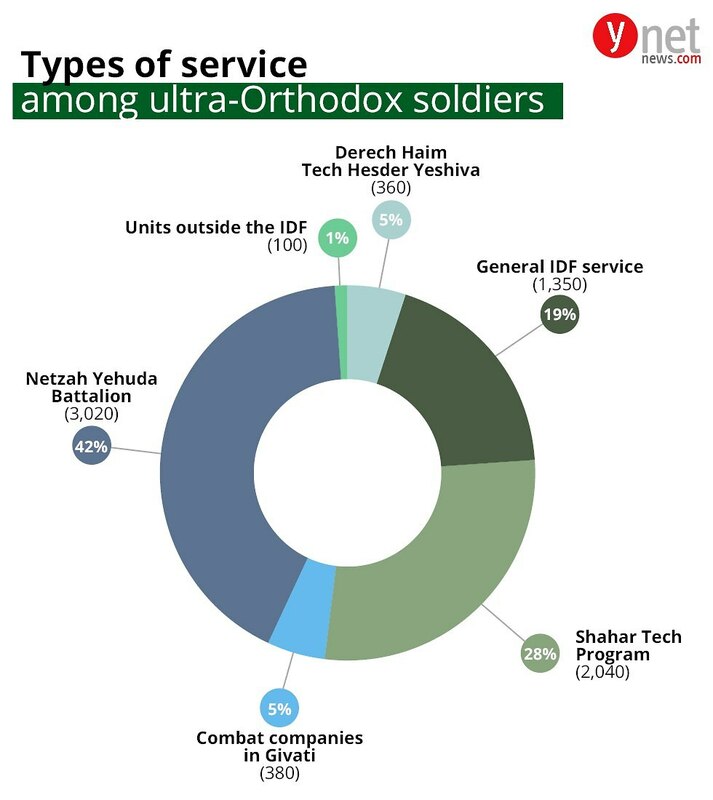 In 2017, some 50% of the 7,250 ultra-Orthodox youths who enlisted in the IDF, served in combat units, whereas 19% (1,350) served in general IDF units. Nevertheless, the army said it has no information about soldiers who left the Orthodox Jewish community during their service. The existing Israeli Defense Service Law gives a lenient definition to Haredi individuals: every youth who studied in an ultra-Orthodox yeshiva for at least two years between the ages of 14 and 18. The goal is to make it easier to meet the recruitment quota and to encourage ultra-Orthodox leadership to send yeshivas dropouts to the army. “The army didn’t define General IDF Service in relation to Haredi soldiers. Given that most Haredim are interested in a military service that is adapted to their lifestyle, the question arises as to whether soldiers from Haredi background in General Service are former ultra-Orthodox members,” the report states. With that said, the number of ultra-Orthodox recruits is on the rise. As for funds allocated to lone soldiers’ assistance, which stood at NIS 180 million in 2017, the cost of recruiting ultra-Orthodox soldiers can easily exceed NIS 100 million a year, despite their small numbers compared to the general recruits population. IDF aid program for lone soldiers includes education and family stipends, a monthly allowance (NIS 542-962), food stipend (NIS 150 a month for the purchase of food products), various types of unit grants, a special grant for soldiers in distress (up to NIS 10,000 for a year of service), loans, a friendship fund, special purchase vouchers, special work permits, reduced electricity bills, and holiday gift packages among others. In addition, post-service assistance is provided in the fields of employment, housing, municipal taxes, entertainment and income tax. “I have no way of knowing who left the Haredi community and who did not, we do not have an ultra-Orthodox-meter in the military. 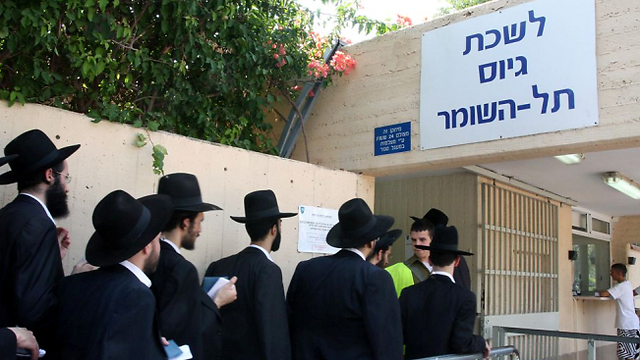 We go according to the law—a Haredi is someone who studied in an ultra-Orthodox institution for at least two years. A soldier who wants to serve in the IDF as an ultra-Orthodox soldier is entitled to do so even if he left the ultra-Orthodox community,” the senior officer explained. A few months ago, Ynet revealed that a large number of Haredim who are registered in national-civic service, get hundreds to thousands of shekels a month without doing the job they have been assigned to do. The Knesset report stressed the large scale of this phenomenon. In 2013, the Israeli Defense Service Law set a quota for national-civic service recruitment. According to the report, the quota has not been met in the years since then, and the number of volunteers is declining. In 2014, the quota for national-civic service volunteers was 1,500 Haredim, but only 744 ultra-Orthodox volunteers were recruited. In 2015, 733 Haredim had volunteered, while the quota stood at 1,800. In 2016, only 562 volunteered to the national-civil service, compared to a 2,000 quota. Last year, the number stood at 571. “The IDF attaches great importance to the recruitment and integration of soldiers from the ultra-Orthodox community, and therefore, there are several special military service tracks for these soldiers. Regardless of the track chosen, any soldier facing financial hardships is entitled to benefits such as family stipends, housing benefits, and more,” The IDF Spokesperson’s Office said in response.